Gwen Dekker Cowhy was born and raised in Ann Arbor and attended Allen Elementary, Tappan junior High and Huron High School. She and her two younger brothers were raised by her mother, a former high school English teacher, and her father, a biochemistry professor at the University of Michigan. She loved growing up here and loved school—particularly the outdoor field trips into natural settings. 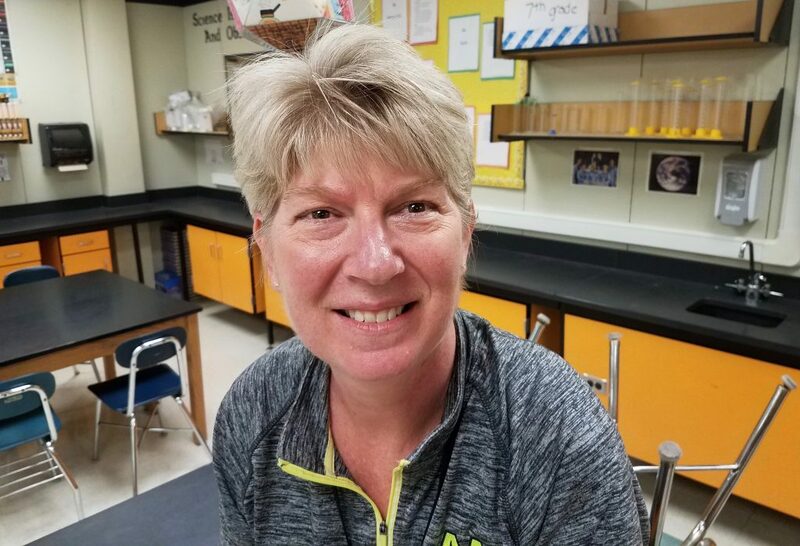 Cowhy earned her bachelor’s degree in sciences at Calvin College in Grand Rapids, and later—while teaching—received a master’s in middle school science from Eastern Michigan University. 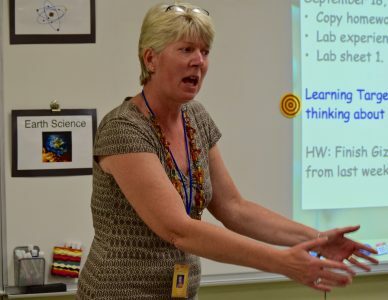 She began her career with AAPS teaching part-time at Dicken Elementary. 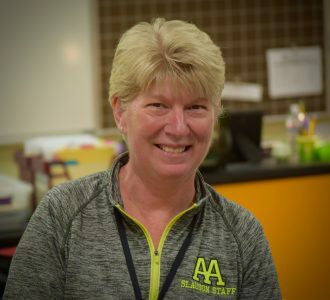 From there, she taught a fifth-sixth split at Abbot until AAPS switched from the junior high to middle school model, and sixth grade was moved into middle school. She then moved to Slauson in 1987, where she has worked ever since. Cowhy and her husband Jim have one daughter, Ella, a freshman at Chelsea High School. They live on 15 acres in rural Chelsea in a house Jim designed and built. It’s a relaxing 22-minute drive from Slauson. What are your favorite memories of being a Tappan Junior High School student? I really enjoyed my group of friends. Every seven years my dad went on sabbatical. So we had just gotten back from a year in California, and I came to that school getting to know a lot of new kids from all the feeder schools. Those friends are still friends today. And I really enjoyed the foreign language program. I started studying French and continued that into college. I really enjoyed my junior high years. What was always written on your report card in grade school? I was a quieter, shy girl, and somebody the teacher could count on. If a teacher was absent, I was one of the five kids a sub could ask if we were really supposed to have recess four times, and I’d begrudgingly say no. What inspired you to become a teacher? I love being with people and I thought: What would be a career where I could work with people and make a difference? And again with parents in the education fields, I heard about it all the time. For me, it was a real natural career choice. I often feel that working with the kids is just the best. You get paid to do what you love doing. It’s an awesome job. Did you have a Plan B? I thought about going into nursing or medicine of some sort, and I think that’s the overlap of science. And I still wonder sometimes when my teaching career’s finished if I won’t go on and do something in medicine just because I enjoy it a lot. Does that mean you plan to retire sometime in the next few years? I don’t know. Right now I’m enjoying it. I’m having an excellent year. My students are real responsible kids. There’s a supportive community, and my colleagues in the building make it fun to come to work. As long as I continue to feel I’m making a difference and helping kids grow into caring young adults and good critical thinkers, I’ll keep going. Describe an average workday. I get in about 7:20 and it’s quiet. I set up for the labs we’ll be doing that day. I start with my eighth grade class and then I have five minutes before my sixth graders come, so I have to plan my day before first hour starts and be ready for the whole day right away. Seventh hour ends a little after 3, and I try to leave no later than 4:00 because of my family obligations. In the evenings, I grade papers, and often it’s at home that I update PowerSchool. Do you ever experience burnout? By the time the school year is done, I’m really looking forward to a summertime break. When I was a younger teacher, I did summer schools some years, but after doing that a couple of years, I decided that was not a good summertime break for me. If I was going to do a summertime job, I needed to do something that was not constant teaching. Now I enjoy being able to go to our family cottage and spend time in northern Michigan. Favorite websites, and apps you can’t live without: All things Google. I use my computer for everything. 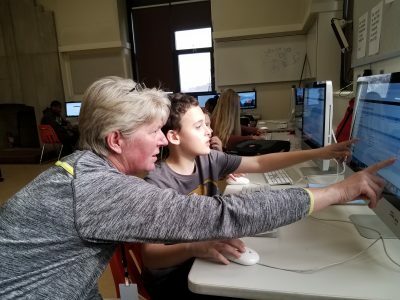 What is unique about teaching at Slauson? The strong, supportive, highly educated, excellent teachers. They are wonderful role models to work with, and I learn so much from talking to them, and from them sharing ideas. It’s just a wonderful building and climate to be in. And I’m speaking of people in the science department, and outside the science department. I have very dedicated, hard-working colleagues who are always willing to help out. 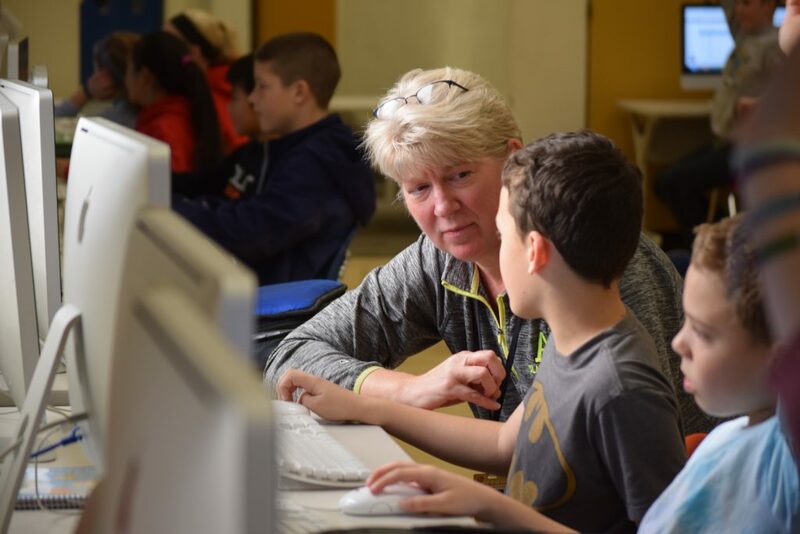 In your 32 years with AAPS, what have you learned about teaching? Teaching is a very rewarding job. You work very, very hard. But then there are former students whose weddings you go to, or who come back to talk to you. And I’m starting to have students whose parents I’ve taught. There’s just something really good about that whole thing coming full circle. It’s a good feeling. And you certainly learn to multi-task. Any advice for new teachers? Be prepared. Come to school early in the morning when it’s quiet and you can make sure you have your day ready to go. Know that you’re going to get every little bug known to mankind because kids will share it with you and if your immune system is not very good, so make sure you get your flu shot early. Do you agree with those who say middle schoolers are a particularly difficult group to teach? I think middle school is a special age. They are not young children anymore. They are not confident adults. They are becoming those independent critical thinkers and I love being around kids at this age. There’s never a dull moment. There’s never a day that was like the day before. They keep you on your toes because you have to do things that engage them. I’m constantly looking at how I can teach a subject or a concept or a learning target and keep it exciting for the kids. My day goes by so fast. I’m never looking at the clock thinking, `Is it time for school to end?’ It just goes by super quick. So how do you keep students engaged? I really like doing a lot of inquiry labs, where the kids are able to do and see things that support the science concepts they’re learning. I feel when they’re actually able to do experiments and gather data and can use that evidence to support claims they’re making, science becomes alive. Why do you think you’re having such a good year this year? Last year and the year before that, I had very large classes. I had more than 35 students in a class. And this year they hired some more teachers so we have more sections of science. So now my class sizes are 25 to 27, and that has just been a huge game changer for me and for the education of the kids in my classroom. There’s just room for us to move and be, and they’re not on top of each other when they’re doing lab. If someone’s not having a great day, there’s some space to be away from someone. So it’s cut down on any negative interpersonal actions between the kids. There’s room to be. I still spend time grading papers. But I feel I get to the bottoms of the stack much sooner now. It’s been a necessary breath of fresh air for me. Is there a difference between girls’ and boys’ interest in science? Most of my highest achieving functioning students are my girls in middle school. And that’s been true for quite a while. I’ve often thought about women in science and engineering and how to keep that love alive. I think in middle school there’s still a lot of excitement and interest in science from the young ladies I teach. I see it in my daughter at home, too. I don’t know if it’s just because I love science and math. But I don’t see it dominated by the gentlemen in the room. They’re good students also. But I don’t hear the quiet, “Let the guys do it.” My girls’ lab groups are very strong. Which is wonderful. Congratulations, Gwen…it is a great pleasure working with you not only as a colleague but also as a mother of students who attended Slauson Middle School. Congratulations, Miss Cowhy!! I had you as a teacher during my time at Slauson and I still fondly remember the penny experiment fondly!